To many a pistonhead, the ultimate in Bugattiness is the Type 57 Atlantic. You'll hardly get an argument out of us: ultra dope automobile. However, after intense deliberations with the Postfather we decided that the pre-War Bug demanded by our merry old Garage has to be the Royale. Designed at the height of the jazz age by Etorre Bugatti to be the most magnificent car ever created, the Type 41 was a beast of a machine specifically intended to humble the Rolls-Royces, Bentleys, Hispano-Suizas and Delahayes of the day. And boy, did it. While records are made to be broken, at various points over the last 80 or so years, the Royale has been the biggest, most powerful (with the biggest engine) and most expensive car ever created. Adjusted for inflation, the ultimate Bugatti would have set you back $700,000. Well, not you. Even though it was designed with royalty in mind, the wealthiest kings of Europe had trouble getting their hands on the majestic Royales. Take poor King Zog of Albania. Ettore refused to sell him one stating, "The man's table manners are beyond belief!" Luckily, Ettore's never seen us eat. Let's get the size thing out of the way. 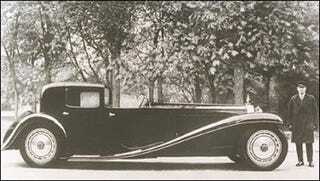 The Bugatti Type 41 Royale is the largest production car ever built. The 1976 Cadillac Fleetwood, what most people think of when they think longest car, had a wheelbase of 157.5 inches. The Royale? 169 inches. At 236 inches long, the Bugatti is in fact 3 inches longer than the Caddy, however it weighs 3,000 pounds more, for an Excursion like total of 7,500 lbs. The drum brakes are 18 inches in diameter and the cast "Roue Royale" wheels are honest to goodness 24"s, the largest ever fit to a production car. Of course, the insane 12,763cc straight-8 is the most massive engine in any (production) car. Ever. Actually, we should spend more time talking about the engine. The 12.7-liter inline-8 was four and a half feet long by three and half feet high. This meant the top of the hood was 5 feet off the ground! Prototype engines were even bigger - 14.7-liters. The bore and stroke measured 125 mm x 130 mm. Extremely advanced for its time (designed in the 1920s), the big boy had a SOHC and 3-valves per cylinder while knocking out a truly epic 300 hp. Let me put that in perspective for you. A contemporary Cadillac V16 made 165 hp. Most firsthand accounts of piloting the Type 41 are filled with shock and awe at how quick, nimble and "svelte" the behemoths feel. That's torque for you. How much torque? I can't find any numbers, but Ettore kept Bugatti solvent during the Great Depression by selling the engine for use in locomotives. We'll just make like we're Brits and call it, "adequate." Only six Royales were ever built and amazingly, despite accidents, frozen engine blocks, eight decades and World War II, all six still exist. Though if you hunt around on Google for images, you will find at least a dozen different Type 41s. That my friends, is coach building. The first Royale, chassis #41 100 had a total of five unique bodies. Through sheer efficiency of design Ettore was more than capable of creating some of the most gorgeous racing cars of all time. However, his luxury efforts were a little bit stuffy. Some, like me, might even say old fashioned and dull. Luckily we had his son Jean, the man responsible for most of the really gorgeous Type 57s (57SC Atlantic, anyone?). After Ettore fell asleep while driving and crashed the first car (while clad in its fourth body) the 23-year-old Jean got his hands on the massive hull and created the Coupe de Ville, also known as the Coupe Napoleon. This is probably our favorite Royale. Just a knockout. Jean also designed the swoopy Esders Convertible Royale (chassis # 41 111), infamous for not having headlights as Mr. Esders didn't like driving at night. Sadly, King Carol II of Romania hadthe second car rebodied to more closely resemble the Coupe Napoleon by the Parisian Henri Binder. However, he totally missed the elegance of young Jean's design. None other than Ferdinand Peich bought #41 111 in 1999 for around $4,000,000. The third car, the Fuchs's car (chassis # 41 121), has a bizarre history. Bought in 1931 by Dr. Josef Fuchs of Munich for the equivalent of $41,000, Herr Doctor was forced to flee Germany by the Nazis. His family and the Royale went first to Italy, then Shanghai before finally settling in New York. Just before WW2 his engine froze (from winter cold) and cracked and the car sat in his backyard under a tarp for many years. In 1943 Charles Chayne bought #41 121 from a scrap yard for $400 plus $12 tax. Notably, Mr. Chayne eventually became the Vice President of Engineering at General Motors. Chayne restored the car and donated it to the Henry Ford Museum in Dearborn, MI, where it's still on display. Chassis #41 131, the fourth Royale, sports my third favorite body. There is something just massively British about it, reminiscent of the Daimler Double Six 50. Seeing how the body was crafted by Park Ward & Co Ltd of London this makes sense. It's also the only Royale to sport side mounted spare tires. The car was sold to a British Captain named C.W. Foster and it eventually wound up in the Schlumpf collection. Remember that name, Schlumpf. If the rumors are to be believed, chassis #41 141, the 1931 Kellner Coupe, is the most expensive car ever. In 1990 a Japanese engineering firm is believed to have paid $20,000,000 for the fifth Royale. Encouraged by the sale of the Esders and Fuchs cars, Ettore decided it was high time to penetrate British high society. He contracted with the distinguished French coachbuilder Kellner to build something special for London's Olympia Auto Show. The results were beyond what anyone could have expected — just a masterpiece. Yet due to the financial realities of the times #41 141 never sold. Ettore just kept it. This car is currently owned by Bugatti. The most famous Royale of all, the Double Berline de Voyage, has had at least 10 owners including Briggs Cunningham, Bill Harrah and OG rightwing freakazoid Tom Monaghan of Domino's Pizza fame and fortune. Chassis #41 150 features by far the stuffiest old school body work and might very well be the second oldest of all the Royales. It may currently reside in Korea. We can't end this entry without discussing the "seventh" Royale, as its story is simply incredible. Rest assured, Ettore Bugatti only built six Type 41s. Yet a seventh exists. Huh? Keep reading. Fritz Schlumpf was a wealthy Swiss industrialist that owned several successful textile mills in Mulhouse, France. He also happened to be obsessed with cars, most notably Bugattis. I've heard different takes on Schlumpf. Some claim who was a cruel, petty man who walked the floors of his mills with a bullwhip fastened to his side, intimidating the piss out of his workers. Others say that he was generous to his men, paying for vacations, installing a movie house on site and personally driving expectant mothers to the hospital. Whatever the truth, Schlumpf loved cars in ways that you and I can only dream about. Need proof? He constructed his own secret Fantasy Garage to house his immense collection of mid blowing automobiles. The post war economy was booming and Fritz was able to buy basically anything he wanted, including 18 of Ettore's personal cars. In fact, in 1967 he owned 105 Bugattis. Schlumpf also had the requisite Ferraris, pre-War Mercedes racers, Le Mans winning Lotus 11s — essentially whatever he wanted. Schlumpf had so many cars that he converted one of his mills into a giant museum/workshop and kept workers on to repair and maintain his impressive but very private collection. However, as the textile business began moving to Asia in the 70s, the workers began striking. Word got out that the boss had a secret collection of priceless cars purchased with their sweat. So they rioted. However, being French, once they smashed their way inside they were awed by the beauty of what they found. So, they kept the strike going for two years, forced Schlumpf into bankruptcy and turned his collection into a national museum. One of the vehicles inside Schlumpf's converted mill was the seventh Royale. While not from the Bugatti factory, it can't be considered a replica as it was constructed using parts and tooling from the factory. Bugatti nerds referrer to the car — built to look like Jean's second body style, the Esder's Convertible — as the "Seventh of Six." As for Schlumpf, he and his brother were forced to flee to Switzerland. Legend maintains that a forlorn Schlumpf absconded with the sterling silver upright elephant hood ornament from the fourth Royale, all that he had left of his life's obsession. Do the man a solid and vote the Bugatti Type 41 into our Garage. Be sure to click through this very copyrighted gallery. Pay special attention to the interiors.